The power of technology in the hands of students can be both a terrifying and incredible thing to behold. Students previously left to daze in the back of the room or too shy to take part in a discussion can now be heard. Subjects that pique students’ interests are no longer road kill on the way to the land of high-stakes tests. 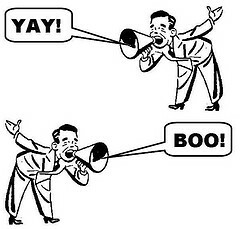 Even the most boring of interactions has an up-tick of engagement when technology is involved. 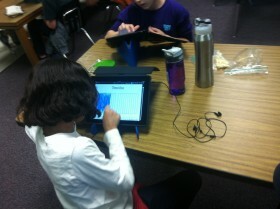 I recently witnessed one of our 1:1 fourth grade classes engaging with those dreaded “Fractions worksheets”. I walked in and the class was silent, even in rapture if you will, with their fraction worksheets. I even heard one of the students proclaim, “This is fun!” This was not some sort of strange Twilight Zone episode, it was the teacher, Mr. Lofgren, making use of his newly delivered iPads to turn an everyday mundane task into one of excitement. Now, I agree, this is purely a substitutive task on Dr. Ruben Puentadura’s SAMR model, but the participation was incredible to behold. Every student wanted to share what they had learned, because, they were excited about learning. While this was an example of iPads in the hands of kids early, and the nuance of the device still intact, I skipped across town to take part in an interview with a 3rd Grade 1:1 teacher, Ms. Wright, and the local news. Ms. Wright has had the iPads since last Spring and by her words they, “Completely transformed the way I teach and my motivation to teach and learn.” Surely, all the amazement and wonder at the hands of a magical device must have some downside? Well, it turns out, there is. Two weeks prior to my experiences at the local elementary campuses, I heard story after story from some concerned parents of our secondary students about distraction in the classroom. While there were only a few cases of this, I decided to dig a little deeper into why some teachers “just got it”, while other struggled with it. During the course of my investigation, NPR posted this interview last week with some educational leaders all having various experiences with 1:1 tablets in their schools. During the course of the interview, a caller called in claiming this was “entirely appalled” at the direction schools were going in with technology. During the course of his rant, he made the claim that these devices “cover up bad teaching.” This is where I have to disagree. In fact, as discovered from the previously mentioned situations, 1:1 technology seems to amplify teaching ability. Let’s take the first two examples, Mr. Lofgren and Ms. Wright. While both of these teachers were at different levels of having iPads in their classroom, their students still used them appropriately. In the case of Ms. Wright’s class, the technology had almost become invisible and just a tool students used to expand on their own learning. In the latter example, it turns out, a few teachers hadn’t really accounted for the idea that this access carries with it some level of expectation of use. It had actually amplified what had been a flawed system in classroom management. Unlike what the NPR caller stated, bad teaching is easier to cover up when the students are forced to turn off all technology, sit in rows, and quietly listen to lecture. Love this post. I definitely agree with you that technology doesn’t cover up bad teaching, it only amplifies it. Being someone who is new to an Educational Technology position, I have seen this first hand. I wonder if technology will force these bad teachers out of the profession or if they will learn to change and adapt to the new world of education. Lori – I’ve seen it both ways. I’ve seen technology inspire the struggling or “bad” teacher to change and grow. I’ve also seen them dig their heals in and flat out refuse to use it. The school exists for the kids. Not me. Not the teachers. As long as that’s your goal and objective as an admin, Ed tech, or classroom teacher, you’ll always err on the side of what’s right. As you are just beginning your career in Ed Tech, be alert to those that teach for themselves. Thanks for your comment! Agreed – technology has both it’s upsides and downsides. Teachers have to be very observant when a 1:1 has been implemented because of this. Using technology to either lighten or engage a school subject creates a better learning environment for students, but if the teacher isn’t positive of how to handle that enhancement, it can go South. It’s also important that the teacher or school district does its research on how to use iPads effectively in learning environments. 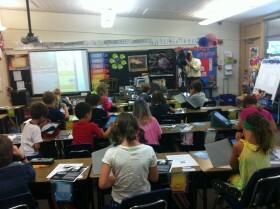 If you’re interested, check out the article below on new ways to use iPads in classrooms! Ha, devices “cover up bad teaching.” Does this not suggest that the bad teaching would be improved?! hahaha love it! Cover up our bad teachers any day if it means the students are getting a better education because of it!